Tiger Golf traveled to Persimmon Ridge Golf Course for the Battle of the Bluegrass Tournament. The team has taken some hits from injuries with two of their top golfers. Drew Doyle (freshman) and Shawn DeWeese (senior) will both be out for the rest of the season. However, the Tigers still are optimistic as Regionals approaches in nine days. Next, we will look at the Tiger Cross Country Team. The Tigers won the Trinity/Valkyrie Invitational, one of the most prestigious regional races, with a score of 96. The runner-up was nationally ranked Carmel high school with a score of 105 points and Trinity placed third with a score of 139. The Tigers were led by junior Patrick Schaefer, sophomore Grady Shiflet, junior Cooper Marchal, and sophomore Zach Larkin who placed eighth, 12th, 13th, and 25th, respectively. Other major contributors who stepped up for injured top five runner senior Ryan Guenthner were junior Eric Portaro, who also scored for the Tigers’ seeded team, and Thomas Knepshield, who was the sixth to finish for St X. Both Portaro and Knepshield had personal records of over 20 seconds. Portaro ran a 16:20.40 and Knepshield ran a 16:26.56. The team will begin competing out-of-state over the next two weeks at the Palatine Invitational and the Great American meet. The Tiger Football team was firing on all cylinders in their clash with traditional powerhouse Highlands on Friday night. The Bluebirds spotted the Tigers 38 unanswered points in the first half before ending the scoring run near the end of the second quarter. On offense, the presence of senior wide receiver Blake Roshkowski was felt for the first time since last season. The coaches had been easing him in the last few games, but this past game was the first time they really cut him loose. Roshkowski proved he was ready to go, rushing for 45 yards and one touchdown and caught two passes for 40 yards and a touchdown. He was not the only contributor, however. The Tiger Offense rushed for 300+ yards in their victory. Sam Taylor, celebrating his 18th birthday, was given a nice present of 134 yards and a touchdown. Will Ginter added 43 yards and had an ankle-breaking touchdown run as well. Defensive play was highlighted by an interception by junior DB Jake Netherton, and a 41-yard fumble return by senior linebacker Chandler Simpson. The defense allowed 331 yards, but much of that came with the second-stringers in during the second half. The first team allowed only one touchdown towards the end of the first half. The game ended with the Tigers winning by a score of 45-18. The team now host PRP at home next Friday. The Panthers are coming off of a 29-10 loss to Trinity. 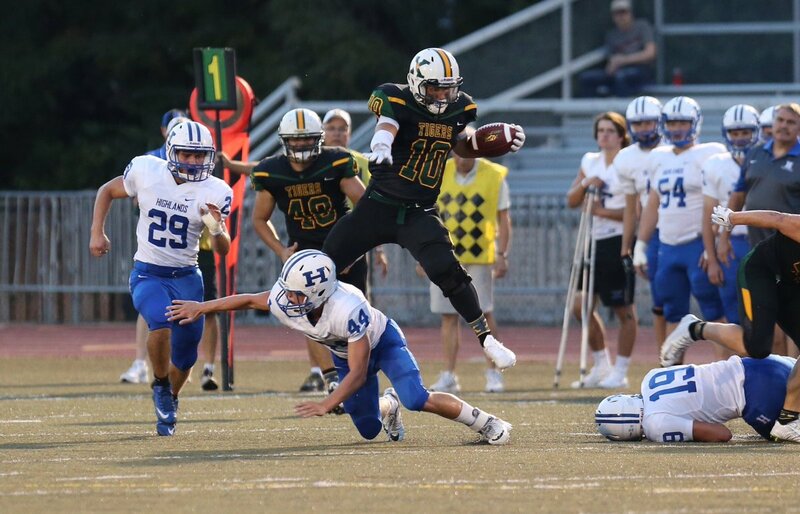 The Freshman and JV teams both notched huge wins over Ohio powerhouse Moeller on Saturday. The freshman team won 6-0, scoring on a punt return for a touchdown. The JV team won 49-31, led by wide receiver Brycen Harkins and running back Anthony Moretti, who eached scored twice. Last but not least we least we highlight the Tiger Soccer team. Coming off of being upset by Manual last Thursday, the team had to do some soul-searching over the weekend. They traveled to Indiana to play powerhouses St. Louis Marquette and Quincy Sr. High Schools. Both games resulted in 1-1 ties. Goals were scored by Sam Graber and Alex Piscrita, respectively. Tiger Soccer has also been plagued with a few injuries, with midfielders Trent Ennenbach, Bennett Moorman, and forward Brad Middleton all on the sidelines. The question now is who is going to step up to create some offensive firepower. That will need to be answered soon as postseason play looms. For now the Tigers will hold steady, and look on to a district matchup against Brown on Tuesday. Posted on September 18, 2016, in Tiger Cross Country, Tiger Football, Tiger Golf, Tiger Soccer. Bookmark the permalink. Leave a comment.